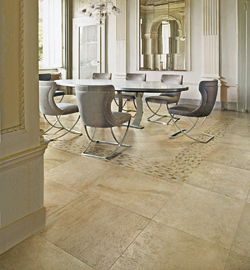 Cesare Magnus emulates the shades and textures found in natural Travertine, while avoiding any repetition in design. Available in four colors - Light Splendor, Bronze Allure, Auburn Blaze and Golden Aura - and four sizes. Trim package includes mosaics and chair rail.